While Russian mothers have traditionally been fairly young, more and more women are taking a page from their European counterparts and delaying motherhood. Being a mother at age 22 or 23 is still common in Russia. Until recently, women who had children after age 25 automatically fell into the category of “older mother.” This is just one way society tells Russian girls they must give birth before age 30. It is scientifically proven that being a young mother is much better for physiological reasons, but it’s the social expectations that sometimes carry the most influence. Alexandra, a 29-year-old lawyer who lives in the Moscow suburbs, is getting married soon because she doesn’t want to become the black sheep of her family. “All my friends, my cousins and sisters are married and have children. They always ask me, ‘What are you waiting for?’ I can’t waste any more time; I’m almost 30! I’m getting married, and if my marriage doesn’t go well, at least I'll have my child,” she said. However, women like Alexandra may soon be in the minority in Russia as the country adopts the long-standing European trend to wait longer to give birth. According to recent figures from the Institute of Demography at Moscow’s Higher School of Economics, the average first-time mother is 28.8 years old in Europe, 28.4 in North America, and 27 in South America. The Russian Ministry of Health and Social Development doesn’t have exact data for the average age of first-time mothers in Russia, but statistics from a number of unofficial sources put the figure at about 27. According to some estimates, in Moscow women tend to have children between the ages of 23 and 28, while in other regions of the country mothers are still a bit younger. What is more worrisome is the low fertility rate that has become a serious problem across Europe. In 2003, the number of children per woman in Russia fell to 1.3, and after a bump it now stands at 1.59. The European average is 1.6, with the southern countries (Spain, Portugal, and Greece) at around 1.4 and central Europe even worse off. France, Ireland and the Nordic countries maintain a relatively high birth rate (2.01- 2.07). The Russian government, concerned about the demographic crisis, has begun several programs to encourage Russians to have more children. The most important of these initiatives, the benefit program known as “mother’s capital,” involves a certificate worth 365,000 rubles (9,125 euros, $13,000) for mothers having a second or third child. The money can be invested in a mortgage, a child’s education or the mother’s pension fund. The slight increase in the birth rate seen over the last two to three years is linked to the mother’s capital program. But the measure has a downside that is important to most women: The money cannot be received in cash. Other subsidies—above all support for the birth of a first child—are still quite low when compared with other countries. In an unprecedented move several years ago, the mayor of Ulyanovsk declared Sept. 12 a “Day of Conception,” and encouraged couples to stay home from work to procreate. Those who had a child nine months later received a prize, and families whose child was born on June 12 won a car. On top of the financial issues, if the challenges of reconciling working life with family, waiting lists for childcare and many other problems that mothers face every day, it’s not surprising that women aren’t in a hurry to give birth. The need to finish higher education, start a career, buy an apartment along with and other ambitions are pushing women to delay motherhood. A couple of years ago, in an unprecedented move, the mayor of Ulyanovsk declared 12 September to be the “Day of Conception,” and encouraged couples to stay home from work to procreate. Those who had a child nine months later received a prize, and families whose child was born on June 12 won a car. The Ministry of Health and Social Development appears quite optimistic about Russia's demographic prospects and is pushing a marked increase in the birth rate for 2016. But this prediction should spark some uncertainty, unless other Russian cities are ready to copy the Ulyanovsk experiment. In Russia, mothers receive 140 days of maternity leave at 100 percent salary, which cannot exceed 34,583 rubles (864 euros, $1,260). For a year and a half, 40 percent of the mother’s salary is paid, which cannot exceed 13,833 rubles (345 euros, $500). The main advantage for Russian mothers may be that they can remain on maternity leave for up to three years without losing their jobs. United Kingdom: maternity leave may last up to 40 weeks, of which only 18 are paid. The salary is 90 percent of average weekly earnings for the first six weeks, followed by the regular rate. Norway: Maximum of 52 weeks per birth. Women who have worked for six out of the previous 10 months before giving birth are entitled to financial benefits of 100 percent of salary for 42 weeks; others receive 80 percent of average earnings for up to 25 weeks. Sweden: 450 days off, to be shared between the mother and father of the child. 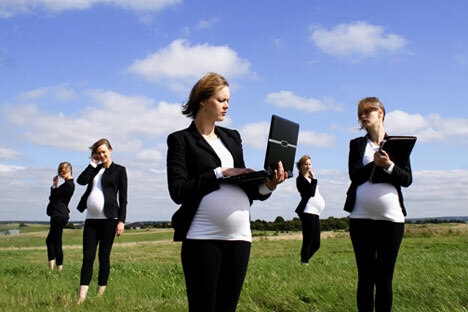 Maternity leave for mothers with 80 percent of monthly salary lasts over 12 months. United States: Federal law requires companies with more than 50 employees to provide 12 weeks of unpaid maternity leave, although employees may be required to use vacation time to cover part of the leave. Individual states or companies may provide additional leave.